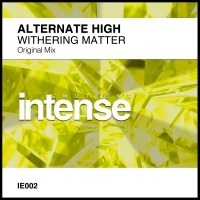 Intense Emotions welcomes Alternate High with an absolute beauty of a tune "Withering Matter"! This is label and artist in perfect synergy as the track has a driving intensity from the very start. Anticipation is built throughout as it drives towards the breakdown which brims with emotion through the lush chords and hypnotic topline. Alternate High captures the very essence of uplifting trance with Withering Matter which looks set to further cement both artist and label as true uplfting trance purists. 'Withering Matter' is available now from Beatport and iTunes.